Central Lutheran Church has been a Minneapolis landmark since the large stone building was finished in 1928. This church community has a storied history of implementing cutting-edge communications technology to enhance its service, for instance in 1922, when the church pioneered religious services on the radio, broadcasting its first service that year. This tradition of embracing new audio technology continues today with the church’s recent installation of a PA system consisting of a number of Panaray MA12EX modular line array loudspeakers from Bose Professional, carried out by systems integrator EMI Audio. 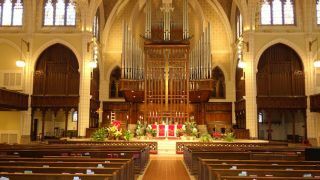 The Panaray MA12EX modular line array loudspeakers are set up in 10 triple-stacked arrays and 10 double-stacked arrays closely aligned with architectural columns inside the sanctuary. These modules—just under 8 feet tall and barely 4 inches wide—unobtrusively project the sound everywhere it needs to be in the 2,000-plus-seat church, while also keeping it away from reflective surfaces, thereby greatly enhancing speech intelligibility. The MA12EX arrays also address the church’s architectural challenge, in which a broad but shallow balcony covers much of the main-floor seating. The loudspeakers, 50 in total, can be aimed precisely, allowing the speakers to be heard clearly in virtually every seat without significantly increasing the volume. These main speakers are supplemented by nine Bose FreeSpace DS 100SE ceiling speakers, with four allocated over the choir area as monitors and five others covering the church’s lobby area. The entire system is powered by four Bose PowerMatch PM8500N networked amplifiers, and speaker management is handled via a Bose ControlSpace ESP-00 processor.